In as much as Innjoo had launched quite some good number of models this year 2015, which includes Innjoo One HD, Innjoo Fire and Halo, they are back one last time with the last models for the year, the new phones from Innjoo are Max series ( Innjoo Max 2 and Max 2 Plus ). 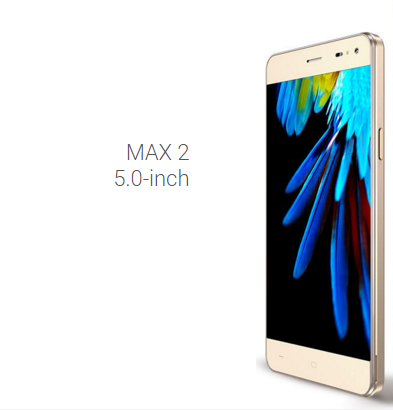 They will be launching this set of models this November but this post is specifically about the first, or younger brother known as Innjoo Max 2, the model will come with cool 8MP front camera and 13MP Back camera followed by Android Lollipop OS running with a 1.3GHz processor backed up with a nice 4,000mAh battery. More couple things about the device you will find below, just in case you may want to buy the Innjoo Max 2 device after seeing this review. Back Camera - 13MP, Front camera - 8MP, (With Dual LED Flash Auto Focus for both Cameras). It's quite intriguing how these devices got a pretty low price, precisely due to competition among the OEM smartphones going on right now. Truth is, they do this normally for buyers to patronise hence if you see the low price it's not a reason to wait if you are interested in buying the device because the prices may tend to go higher later on, we would advice that if you like it, you waste no time in buying the Innjoo Max 2 now.